Brought to you by the pioneers of real-life escape games across the globe!! 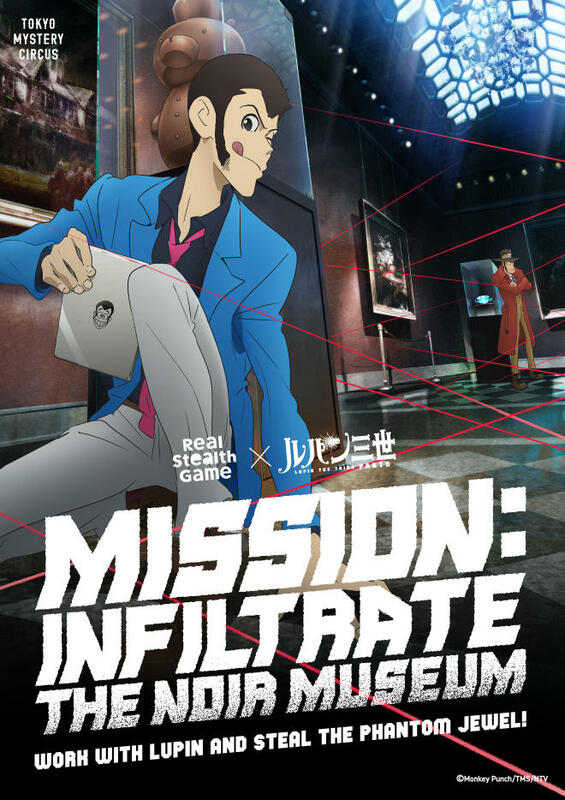 Real Stealth Game x Lupin the 3rd "Mission: Infiltrate the Noir Museum"
The most thrilling experiential game event "Real Stealth Game" collaborates with the popular animation""Lupin the Third"! You are a newbie thief, working with Lupin, Jigen and Goemon to infiltrate a museum and steal the "Phantom Jewel". The venue is crawling with traps, as well as Inspector Zenigata! Dive into a brand new, original storyline with Lupin! Starts 17 April 2019 (Wed) and open almost everyday! This game allows for 1~3 players per team. Up to 30 players can be playing at the same time. However, the game must be challenged in groups of 1~3. *All tickets are time-slot tickets, and cannot be used outside of the time stated. *You can play the game anytime during the session's registration period. If advanced sales tickets are not sold out, they will be sold at the door. Please see here to check the availability of at-the-door tickets.